It seems like every time a jewel is auctioned, someone suggests that a royal family with some connection to the gem ought to buy it. You know, to preserve history and prevent things from vanishing into the thin air of private ownership. Thing is, that almost never happens...except in certain cases. Like this one. The Ancona Tiara is a pearl and diamond tiara with Italian heritage. The body of the tiara includes groups of three round pearls in diamond trefoil surrounds on a pearl and gold base. The tiara is topped with pearls in two rows, a lower row of round pearls and a top row of upright drop pearls which are slightly irregular in shape - clearly old, baroque pearls. And old this tiara is indeed: it was made for Princess Maria Anna Carolina of Saxony (1799-1832) sometime around her 1817 marriage to Leopold II, Grand Duke of Tuscany. The tiara then dropped along down the Italian royal family tree from parent to child for a while, starting with Archduchess Maria Isabella of Austria (1834-1901), the daughter of Leopold II and his second wife (he remarried following Maria Anna Carolina's early death). It ends with Princess Lucia of Bourbon-Two Sicilies (1908-2001), who married Eugenio, 5th Duke of Genoa. Before he was the Duke of Genoa, he was the Duke of Ancona, and the tiara is known as the Ancona Tiara. 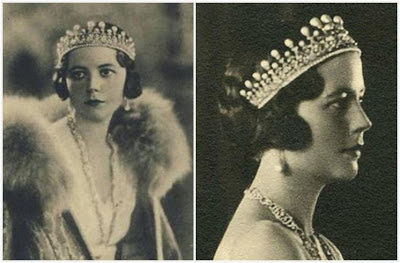 Eugenio inherited the Genoa title from his brother, Filiberto; Filiberto's wife, Princess Lydia of Arenberg, also wore this pearl diadem. From the hands of Lucia and her descendants, the tiara was sold at auction in 1999. But surprisingly, it seems to have remained in the Italian royal fold: it reappeared on the head of the Duchess of Castro - née Camilla Crociani - at the 2004 wedding of Crown Prince Frederik of Denmark and Mary Donaldson. She comes from a wealthy family, and it seems they purchased the piece at auction. Camilla's husband, Prince Carlo of Bourbon-Two Sicilies, Duke of Castro, holds a claim to the headship of the House of Bourbon-Two Sicilies. As long as we still get to see it, I'm happy with any owner, frankly: this is a lovely example of a pearl and diamond tiara. Old and valuable, with a well-balanced distribution of pearls. This is not a diamond tiara with a few pearls, this is a pearl tiara, if you know what I mean. How do you think this rates as a pearl tiara? Programming note: We won't have a Friday post tomorrow. Tune back in on Monday for a look at Trooping the Colour fashion.